Compressed air is ever-present in dental labs: suction systems, tools, grinders, presses and sandblasters are supplied by this universal working medium. The lab instruments and furnishings contain many metres of hoses with dozens of fittings and connection components, all of which have to function reliably. The Zubler company in Ulm, a world market leader in suction technology and ceramic kilns, has to rely on quality components through and through. The origins of Zubler Gerätebau GmbH go back to the year 1922. At that time, Karl Zubler, the grandfather of the company's present-day owner Kurt Zubler, founded a company that manufactured electrical machines. After the war, the company was re-established as a service company for electrical machines. 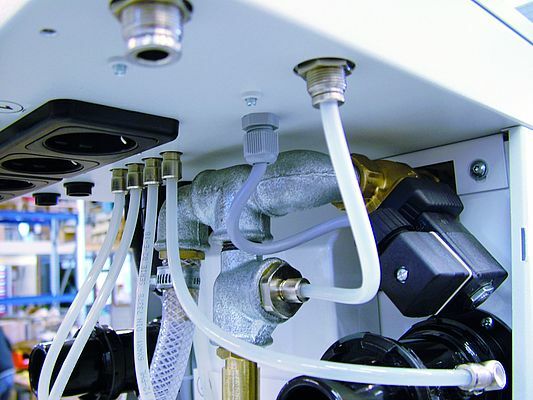 Since 1992 the Ulm-based company develops central suction systems for dental labs and markets an entire series of instruments and components with compressed air connections. They include ceramic press kilns and CAD-CAM systems for dental technology. The company also supplies the required accessories and consumables from a single source. Zubler is the only manufacturer of suction systems for dental technology that can offer every individual customer configuration: from single- and multi-station to central suction systems. On the basis of many years of experience Zubler also carries out planning, installation and maintenance of the lab facilities. The equipment of a dental lab requires an extensive technical infrastructure, which resides unnoticed in the background and includes a branched network of exhaust air ducts and compressed air lines. Compressed air is a universal working medium that is easy to convey and is used in multiple applications at each workplace in the dental lab. It is used to operate air guns and pneumatic tools, to blast and blow off parts and to power hand grinders. The family owned company entered the dental market by coincidence. A dental equipment manufacturer had seen one of the custom-made suction devices in a dental lab. The idea of integrating a similar device in the manufacturer's own product mix resulted in the first single-station suction system, which was then produced in large quantities. The philosophy of Zubler Gerätebau requires that production and development take place in Germany. All electronic components, for example, are developed and assembled in Ulm, so that all control elements come from in-house production. Any components not manufactured in-house are purchased regionally, if possible, which eliminates unnecessary transport distances and costs, and also ensures security of supply. Eisele Pneumatics GmbH & Co. KG in Waiblingen shares Zubler's attitude toward providing products of especially high quality with the label: "Made in Germany". For the past twenty years Eisele has supplied the MSE with high-quality "background" components for reliable compressed air connections that meet the high requirements of Zubler lab technology. The equipment for a dental lab is a major, long-term investment. Therefore it is important to use long-lasting technology and high-quality materials. This also applies to seemingly minor details such as the pneumatic connections. Their seals have to be durable and reliable. Even small leaks in compressed air lines result in high energy costs over the course of a year and the hissing sound of escaping compressed air is not conducive to a productive work atmosphere, since the dental technician's work requires special concentration. For the reliable implementation of transition points, connections and branches in the compressed air system, plug-type hose connections such as those offered by Eisele as series 14 of the BasicLine have proven the right choice. Diverse versions and technical details make it possible to implement virtually any type of connection. They are available in different types, including straight, angle, double or T-connections and feature not only reliable leak-proof seals, but also application safety during installation and maintenance. An Eisele plug-type connection is easy to disconnect even after extended use, without the risk of leaks. The high-quality components of the Waibling-based company provide a very economical connection solution throughout the entire life cycle. The standard versions are available in nickel-plated brass or stainless steel. Every year, Zubler orders and installs large quantities - ca. 30,000 to 40,000 - of the nickel plated versions of about 100 different Eisele components, including quick-release connectors, connecting elements and adapters, in devices and customer installations. These components are supplemented by about twelve kilometres of polyamide- and fabric-reinforced compressed air hoses. The designers and project planners have the CAD data and the well-structured product catalogue at their disposal, to minimise the effort in selecting the right parts also in the case of new developments. More than half of the material is needed for the installation of central suction systems. The FZ2 Variomatic is a highly reliable and clean suction system for four workplaces that was specially developed for use in smaller dental labs. As with every workplace connected to a central suction system, each suction point automatically opens when the handpiece is actuated and closes after a post-operation period for removal of the residual dust. A basic principle of Zubler suction technology is not only to distribute air, but to individually control each point where the air is used. As soon as a suction machine is required to supply more than one workplace, Zubler uses a pneumatically actuated valve for each suction point. 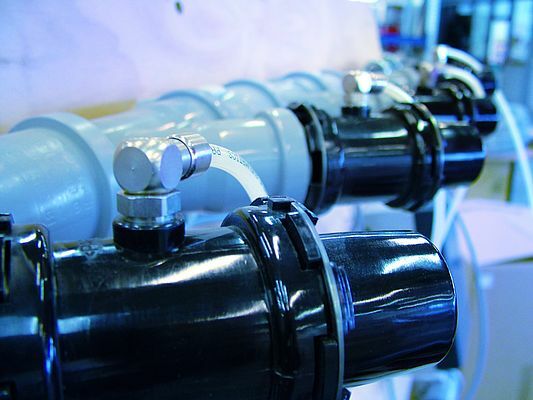 A swivelling threaded angle connector from the BasicLine provides for a secure connection of the polyamide compressed air hose in this application. Zubler installs about 3,000 suction point openers every year and has done so for more than 15 years. Each workplace needs at least four Eisele components, making a total of 180,000 connections for compressed air hoses, and so far there have been no complaints. The version with a release sleeve enables repeated secure and convenient connection and disconnection also of dirty connections or in difficult-to-access areas, for example behind the lab furnishings. The release sleeve protects the inner collet from impurities. 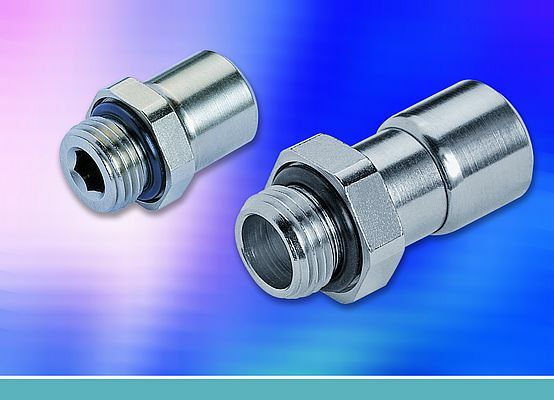 In the BasicLine, the nickel-plated brass plug-type connections with a release sleeve and one or two seals is the right choice for many applications. For Zubler the metal version is especially important, since - in the experience of the Zubler development department - plug-type connectors with a release ring made of plastic cannot guarantee the required long-term reliability and robustness. Also, the metal connectors are more convenient with respect to handling. Eisele is the only supplier of connection components to offer a version with a release sleeve. Components from series 14 of the Eisele BasicLine are also installed in the VarioPress and Vario ceramic kilns. Threaded connections with a release ring are used here, since the connections inside the kiln, as opposed to the connections in the lab installations, only have to be disconnected in the case of repairs. Whether the requirement is for evacuation of the kiln chamber for firing ceramic layers or actuating a pneumatic cylinder for a press ram, the valves must always feature suitable connection technology that can withstand the environment in a kiln with temperatures as high as 1,200 degrees Celsius. The result: dental plates of outstanding quality, to which Eisele has made a significant contribution, virtually unnoticed.